How often do you poke your head in, to check what is going on in your attic and crawl space? Seldom, right? You are not the only one! Most building and homeowners ignore their attics and crawl spaces until some serious problem emerges. Regular inspection and proper upkeep are crucial for a clean, comfortable, energy efficient and healthy home. 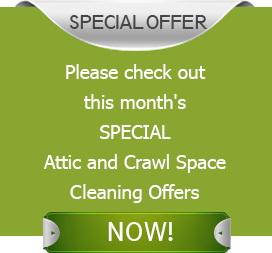 Quartz Solutions is at your service for the enhancement and thorough clean up of your attic and crawl spaces. Dirt and dust build-up over the years is the least of your problems. A neglected attic and crawl space present serious hazards, about the health of the people living in the property. Unnoticed issues can also snowball into a catastrophe that can cost thousands of dollars. Faulty duct systems and damp insulation can lead to high-energy bills. They can also spread germs and harmful bacteria to other rooms. 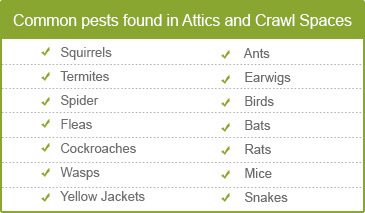 Disease carrying pests like wasps, spiders and roaches tend to infest attics and crawl spaces and wreck them. Rodents and bats are notorious for tearing up ducts, ripping off insulation, wiring and leaving behind droppings. Excessive moisture can influence mold and mildew to seep into the interior air of your living space. Wetness can produce foul odors, and encourage rot in wooden frames. The result can be pricy. A thorough inspection of the premises including a test for the known carcinogen radon gas is step one in the direction of a healthier attic and crawl space. Our experts will show up at your door for a free analysis, and put forward the best cleaning options at the best rates possible. We understand that you want to keep within your budget, without compromising on quality. Our proficient crew will offer you guidance and the most innovative solutions at affordable prices. Parsippany-Troy Hills, in Morris County, NJ, is claimed to be one of the best places to live in the United States. We at Quartz Solutions want to bring more comfort and safety into the lives of the residents, by keeping their attics and crawl space in top-notch condition. We utilize the finest cleaning measures to ensure that residents get high-quality service. Call Quartz Solutions at 973-536-1013 today to avail a free consultation and inspection!